As the Second World War raged, 46 A Class submarines were ordered by the British Government in 1943. In the end only 18 A Class boats were built and 16 of them actually commissioned, including HMS Alliance. HMS Alliance was built by Vickers Armstrong in Barrow-in-Furness, where the majority (10) of this type of submarine were built. The rest of this class were constructed in shipyards around the UK - Chatham, Devonport, Birkenhead and Greenock. This class of diesel submarine was the only new British design throughout the entire war. It was capable of better speeds and could travel a greater range than its predecessors. Its hull was entirely welded. It also had the advantage of producing less noise underwater so the enemy would find it harder to detect her as she crept on by. Ironically through, only 2 of the 16 boats were completed before the end of the war � HMS Amphion being the first to be launched in August 1944 followed later by HMS Astute � and neither of these submarines saw enemy action. HMS Alliance was commissioned in May 1947. After the war various modifications were made to these Overseas Patrol Submarines, as they were known. One such addition was to attach a snort mast � based upon the same lines as the �schnorkel� used by German U-boats during the war. This allowed air to enter the submarine whilst at periscope depth thus allowing her to stay submerged for much longer and to run on diesel engines rather than the slower electric ones. The A Class submarine HMS Andrew showed off her new abilities by undertaking a 15-day trip from Bermuda to England entirely submerged. On completion of the undersea journey in June 1953, the day before the Coronation of Queen Elizabeth II, the news was announced at the same time as two other great feats: Edmund Hillary and his team conquered Mount Everest - 29,000 feet above sea-level, and England won the Ashes! Sadly another A Class submarine that will not be forgotten is HMS Affray. This boat disappeared whilst on a training exercise north of Guernsey in 1951. She was lost with all hands � 75 men. 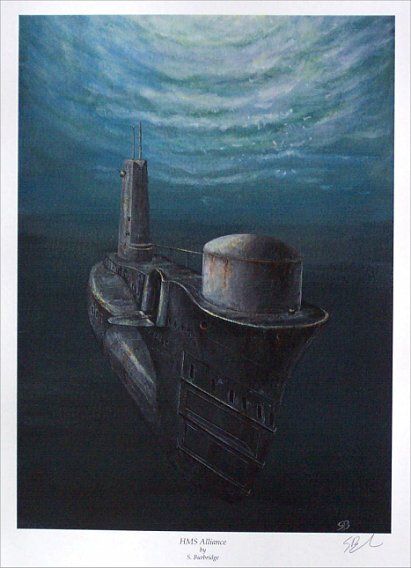 She claims the unenviable title of being Britain�s last submarine lost at sea. HMS Alliance, together with her sister boats, served the British Navy for a period spanning almost three decades. The A Class was gradually replaced with the Porpoise and Oberon Classes. HMS Andrew was the last A Class in service, being decommissioned in 1974. Today HMS Alliance is preserved as a museum piece at the Royal Navy Submarine Museum at HMS Dolphin, Gosport. It is possible to explore the whole boat and be told her history in detail by men who actually crewed on submarines themselves. This painting is priced in £ GBP.